You're a better person than me if you can resist buying asparagus even when it's not in season. As environmentally unsound as it may be, I must confess we eat those delicious stalks year round, and at least once a day when it's in it's delightful but oh-so-short season. This recipe is one of Sophia's favourites for lunch or dinner. Enjoy! 1. Preheat the oven to 200°c, and bring a pan of salted water to the boil. Fill another dish, large enough to fit the asparagus, with iced water. 2. Drop the asparagus into the boiling water, bring back to the boil and then cook for 2-3 minutes. Remove from the boiling water with a slotted spoon, then plunge into the iced water to preserve the bright colour of the asparagus. Retain the boiling water. 3. Meanwhile, in a non-stick pan fry the sliced courgettes in the butter, then add the garlic and cook over a medium heat for around 6-7 minutes until almost sticky. 4. Using the asparagus water, parboil the potatoes. After 10 minutes, add the potatoes and the onion to the frying pan and cook until softened. 5. 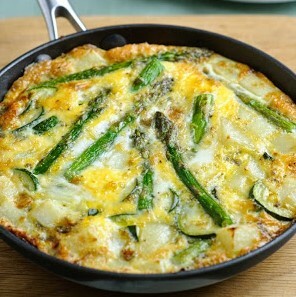 Lay the asparagus into the pan, season the beaten eggs with salt and pepper and then add to the pan. 6. When the eggs have just set around the edges, transfer to the preheated oven for around 6-8 minutes or until the tortilla is set. Turn out onto a plate and serve in slices. Looks delicious! 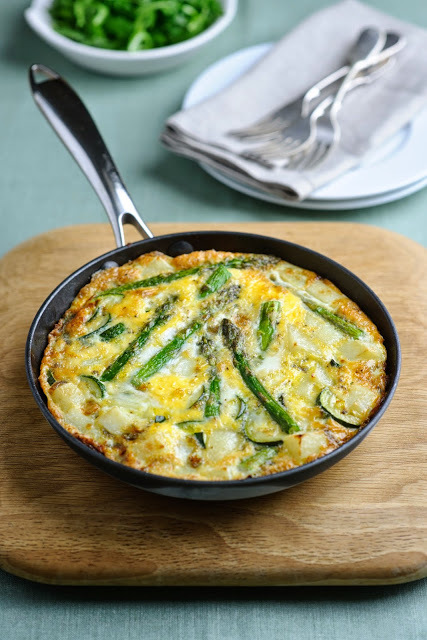 I'm gonna have to bookmark this recipe, I love asparagus too (and yes, also a culprit of the out-of-season buying) - it's just so good!